Taking Salsa Classes: When, where, how? A Word About Private Lessons? Are you enticed by the idea of performing or competing? Every now and then an aspiring dancer asks me for advice on how to really get good in Salsa. Some of these inquirers mean just that, “I want to become a better dancer.” Fair enough. This could range from, I want to be able to execute clean double turns to I want to social dance with any partner without falling on my face, and anywhere in between. On the other side of the spectrum, there are those dancers who mean something more along the lines of “How do I make it to the top? How do I become a well-known dancer, performer, instructor in the scene at large?.” You know, the whole nine yards and then some. That was me on November 2003. If you are one such aspiring dancer, I can give you some tips on both: how to become a better social dancer and how to become a Salsa star, so to speak. 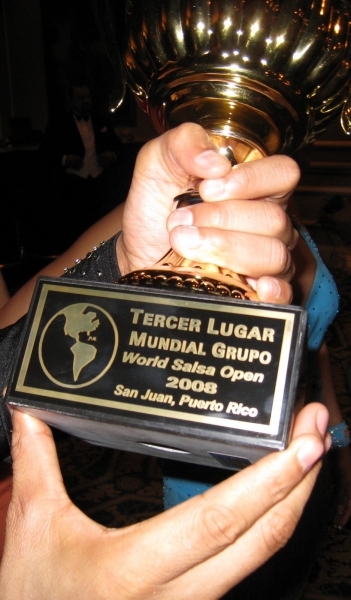 The latter, being a more serious undertaking, may involve any or all of the following: traveling to far away lands for top-notch coaching, taking private lessons (a must), attending Salsa congresses galore, performing in a team or with a dance partner, or the ultimate challenge: competing regionally or internationally. I’ll go in more depth on all of these aspects of training yourself to the top. But first, let’s start at the beginning. If you have been recently bitten by the Salsa bug, congratulations! You have just contracted one of the healthiest infections on planet earth. (And don’t expect to get cured anytime soon, in fact if you resist it, it’ll just persist like a bad cold only can.) Being new to this world of dance, you are probably wondering how to get the most juice out of this newfound hobby that takes more hours of your week than you dare to admit. So here is where I’m going to point out the obvious: you need to dance as often as you can. That’s right, you need to get yourself out there, dance with as many people as you can, on as many dance floors as you can, in as many cities as you can to as many songs as you can. We’ve all heard the old adage: “experience is the parent of wisdom.” And in dance this translates to practice, practice, practice. Embed your body and senses in the world of Salsa so it becomes your world, and not just rehearsed movement but actual feeling associated with it. And classes are a great way to get started.